Tank setup: Planted tank, with open swimming space. Compatibility: Generally an excellent community fish. Water chemistry: Not too critical, but fairly soft and slightly acidic ideally. 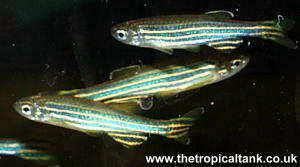 Feeding: Accepts most aquarium foods - feed flake, granules, etc with frozen/live food supplemented. Sexing: Females have a rounder shape and are usually slightly larger. Breeding: Use a temperature at the upper end of the scale and fairly soft water. Breed as a pair in a tank with fine-leaved plants, among which the eggs are scattered. Remove the adults after spawning to prevent the eggs being eaten. Eggs hatch in about 48 hours. Comments: A hardy and highly active shoaling fish for the upper region of the aquarium. It is recommended that they be purchased as a small group, as individual specimens tend to fade away by themselves. Long-finned varieties and golden/albino colour forms are available. They are occasionally associated with fin-nipping, but this is the exception rather than the norm, and they generally make excellent community fish.